Last night, Offset and Quavo accepted the award Favorite Duo/Group in the Pop/Rock category, but Takeoff was nowhere in sight. This is the second award show in a row where Takeoff wasn’t in attendance, following the VMA’s. However, it turns out that Takeoff was just busy in the studio! Offset’s mother, Latabia Woodward, explained why Takeoff wasn’t alongside Offset and Quavo during the AMA’s to accept the award for Favorite Duo/Group in the Pop/Rock category. 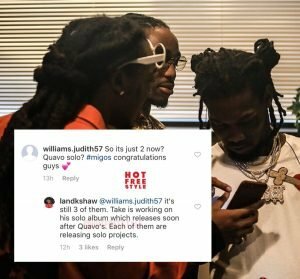 In a social media comment, Woodward reportedly said that Takeoff is getting ready to release his solo album after Quavo and he’s been steadily grinding away in the studio.